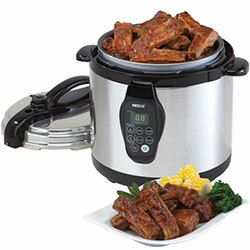 Pressure Cooking Ribs are so tender, juicy and flavorful when you use your Pressure Cooker. Pressure cooking ribs is perfect to give you that juicy, fall-off-the-bone tenderness that everyone loves! No need to slow cook them over a grill all day long. Rib meat is fairly tough, and it takes some cooking time to soften and become tender. Cooking under pressure breaks down those tough fibers in as little as 30-minutes. Another benefit of pressure cooking ribs, is that the rib meat will be super juicy, as it cannot lose moisture while cooking under pressure. You can even pre-cook the ribs in the pressure cooker and then transfer them to the grill or broiler for a final charring if you want. That certainly isn’t necessary, as you’ll soon find out. Barbecue Pork Ribs are absolutely succulent right out of the pressure cooker! Note: Your own seasoning rub could be store bought, or you can try your own blend. A mixture of 1 Tablespoon Dry Mustard, 1 Tablespoon Chili Powder, and ½ teaspoon of Cayenne Pepper works well, or just salt and pepper will work just fine too. Set a rack into your cooker, and add water to just under the rack level. You do NOT want your ribs to be immersed in the liquid. Cut the ribs into slabs to fit your cooker, or into individual pieces if you prefer. Rub the ribs with your spice rub, and set them on the rack into your cooker, meat side up. It’s okay if you have to stack them. Close and lock the lid. Turn the cooker on to high pressure and cook. If you are going to transfer the ribs to a grill, only cook for about 15-minutes, so that they aren’t falling apart while grilling. Transfer to the hot grill or to your broiler for about 5-10 minutes. Baste generously with your favorite BBQ sauce while grilling and you’re done! Grilling or broiling will crisp the surface of the meat. If you are not going to grill or broil the ribs, cook them for about 20-minutes, which will make the meat fairly tender, but not falling apart. If not grilling, after the 20-minutes from step 3, release the pressure and remove the ribs and the rack from the pot. Pour out the water and return the ribs to the cooker. 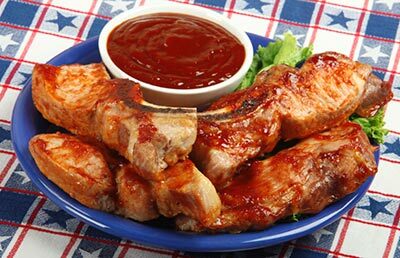 Marinade pork ribs with your favorite barbecue sauce. Coat all sides well. Cook for another 10 minutes. The meat will be very tender and possibly falling off the bones.Enjoy! Learn from this experience, and adjust the cook time to your preference. 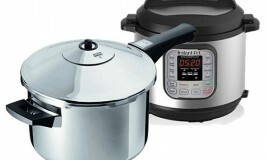 Learn more About Pressure Cooking.